I woke this morning with the familiar feel of anxiety – my heart pounding with anticipation. For a minute I had to let my mind catch up with what my body remembered already – the American Library Association’s Youth Media Awards were today. I haven’t written a book, I have no stake in these awards, but nerves were taking over. There were so many books I have loved this year, so many I wanted to win. I got dressed, pulling on my Charlotte’s Web t-shirt, my son – Liam – handed me his stuffed animal for luck. It is a webkinz – a mighty silverback. Liam kissed it and said he wanted IVAN to win. With tears in my eyes, we headed to school. My students entered, bubbling with normal Monday morning chatter. They talked about what they had done that weekend, what we had in store for us this week. Finally one asked when the awards would be announced. There were groans as I told them it was 10:00 our time, they’d be in computers. I promised to keep them updated and reminded them that the Caldecott and Newbery would be announced when they returned to our room. In reading class we discussed the award. I shared with them Colby Sharp’s video from this past Saturday. The students watched in silence. We talked about what it meant to lay our soul bare and why we thought the video was a brave move by Colby. I read to them the book Woolbur and we talked about how leaders do not follow the crowd, leaders do their own thing. Mr. Sharp is absolutely a leader in their eyes, as is Mr. Schu and many of the authors and illustrators we discussed this morning. Finally, it was time. They headed to computers and I turned on the webcast. It was lonely to be by myself cheering at first, but exciting. I gasped when two books I wanted to win – The Fault in Our Stars and Wonder didn’t win the Printz and the Schneider respectively. However, I trust the committee and am sure the winning books are wonderful in their own right. I look forward to reading them. At 10:40 I headed to pick them up and was thrilled to see that the library class (one of my other reading classes) had joined my group and they were watching the webcast. My colleague, Mrs. O’Brien, and I stood as the Sibert books were announced. My two classes stood and cheered for Moonbird, Electric Ben, Titanic: Voices from the Disaster, and then Bomb. I had book talked each one of these amazing books, the kids were excited to recognize each. Mrs. O’Brien and I smiled at each other as they screamed over each title. I whispered to my group that if they hurried to the room, they could see the conclusion. In record time we sat down in our own library. The Geisel was announced. I lost control of the class after Rabbit and Robot was announced. The screams reached epic proportion. I’m sad that I missed hearing Tom Angleberger yell on the live webcast as his wife won the award, but it was unreal to be in my room. The kids finally settled down for the Caldecott. I reminded them that just because our favorite books don’t win doesn’t mean that the award isn’t wonderful and it would be a chance to “meet” new books. Then we heard them say FIVE honor books. Cheers met that announcement. Then they opened with Creepy Carrots, the kids flipped out. They loved all of the winners – with the exception of Sleep Like a Tiger, which I need to purchase so they can read, I’m sure we’ll love it too. The winner, This Is Not My Hat is such a hit that we gasped out loud. And then, the big moment, the Newbery announcement. They looked at me, we took a collective breath. Three honors. Each one we knew, each one we had discussed, each one we loved. My heart fell. I thought there was no way for The One and Only Ivan to win – there was no way I would know all four books. I felt sick. I almost didn’t want to look at the screen. I briefly debated video taping their reaction to the winning book but quickly convinced myself it would be too much, too sad, so I didn’t. I regret that decision. The announcer got out: The winning Newbery is The One and… and they lost it. I lost it. Screams, high fives, hugs, tears. It was unreal. I don’t think I would have been happier if I had won the lottery. Kids flew at me, begging me to call Mr. Sharp on my cell in my hands. I couldn’t. Even trying to send him a text I realized my entire body was shaking. I looked up at a student in front of me, Rye, and laughed. I said, “I’m loosing it over a book, Rye.” He laughed and agreed. We took a deep breath and kids ran off to inform my reading classes. Our stuffed IVAN was passed around, hugs given to him. He brought us luck. My RTI class came in, we discussed the awards. After lunch my other reading classes met, we read Woolbur, watched Colby’s video, and talked about how it was easier to view after the announcement. And now I’m home. I can’t believe this day. I wish I could have taped the reaction. I wish that a school board member, my administrators, the folks who write standards or create our standardized tests could have seen that. I had 65+ kids celebrating books today, celebrating authors and illustrators. It was incredible and I know it is a day I will not forget, ever. Well, I set out to make this a week of professional reading. That didn’t work out like I thought. I am woefully behind on my PD books but I can’t seem to devote myself to a week of PD only. So my new goal? One PD book and one Newbery book a week – along with whatever other books I can cram in. On tap for this week: Finish Teaching Reading in Small Groups for my PD book, read Secret of the Andes for my Newbery book. Excited for the ALA announcement today! 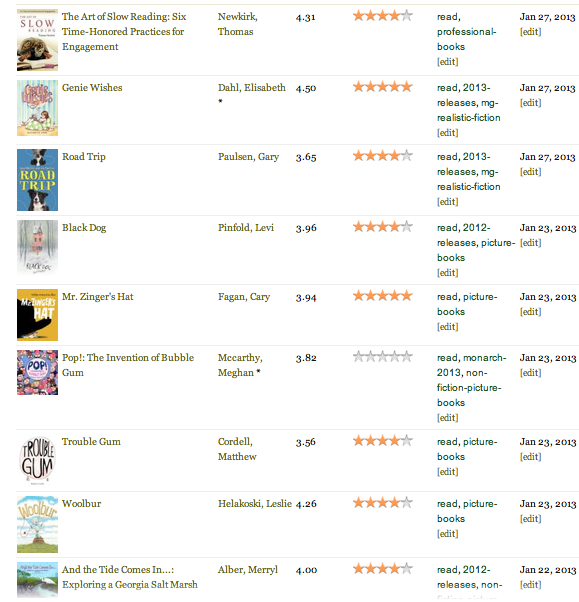 Last year I did a top books of 2011 post at the end of the year. I didn’t do that this year – not because I didn’t have any books to write about, but maybe because I had too many. There were so many books I loved this year, it is hard to even wrap my mind around it. I have shared more books than ever with my students and seeing a book through their eyes makes me look at a book anew. So while this is not a comprehensive list, here are four books written in 2012 that I have read aloud and that fifth graders have fallen in love with too. Interestingly, one was not on our Mock Caldecott list and one didn’t win, but the kids LOVE these books. During independent reading when I conference with other kids and look over at the library area, I often see these books in the hands of kids as they curl up together and laugh as they read. Class favorites. Beautiful books this year in abundance, but these two I read last January and I don’t know that I will ever forget them. They are two books that I hold close to my heart. 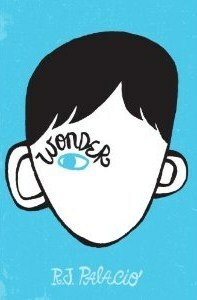 When my school started off this year we held a one book/ one school with Wonder. To be able to get it read by the end of September to all three of my reading classes, I had 71 kids come to my room for thirty minutes a day and I read to them. 71 kids. A normal sized classroom. Fifth graders. You know what? You could have heard a pin drop. Purely magical. 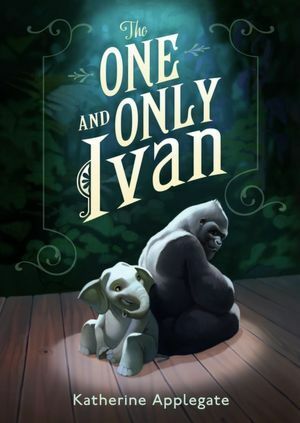 The One and Only Ivan was a read aloud after Wonder, but to my homeroom group only. I wasn’t sure if they would embrace the next read aloud, I knew it would be hard to follow Wonder, but Ivan succeeded. The kids gasped when Bob revealed what happened to his siblings, discussed Julia and her connection to Ivan. Shed tears for Stella. Fell in love with Ruby. I have to say, when I have read a book as many times as I have read Ivan, I sometimes find myself not as enchanted with it as I was on the first read. That has not happened with this beautiful book. January 28th has been circled on my calendar for some time, the date the American Library Association awards would be handed out. I’ve read, and read, and read, hoping to at least have heard of the award winners when they are announced. Some years are luckier than others. Many years I’m blindsided and wonder how I could have possibly missed the books that win. This year I decided to get my class into the fun of predicting the winners. Margie Myers-Culver kindly agreed to do a Mock Caldecott with me. I wrote in detail on Choice Literacy how we created the unit, but I will share that it was a hit. Our only snag? We matched up three fifth grade classes. Two of the classes Skyped before break with no issues. Our third class was to Skype the Friday before break – but they had a snow day. So we scheduled for the Friday after break… ice for them, no school. Ok, we aren’t deterred, the Friday after that… no internet at my school. The Tuesday following, snow day for them. Finally, finally, we met on Skype yesterday. I loved having the students debate the merits of each book – describing the mediums used, how “distinguished” it was in comparison to another. As for the Newbery, it was more difficult to have the students read all of the books that are being mentioned in the same breath as the award. Finally, I came up with a list of 18 titles and told the kids that anyone who wanted to read at least three of them could come in for lunch and recess the week before the award was announced and we’d pick a winner. Out of my 68 kids, about 30 gave up their lunch time to come discuss books. Anyone who felt strongly about their book could stand up and share their thoughts. At the end of our lunch we took a vote, The One and Only Ivan was far and away the winner. Likely my favorite part of the vote was overhearing conversations with other students who hadn’t come to the lunch. When they heard what book won, many added it to their “to read” list as the student informing them of the victory extolled all of the merits of the novel. As for the award ceremony, we plan on watching the live stream on Monday (Watch it HERE). We’ve had great conversations about what we’d like to win. If our favorite books don’t win, they will still remain our favorites. We have decided that would be the chance to “meet” some new book friends. Time will tell, but I, for one, do have my fingers crossed. Two days left! 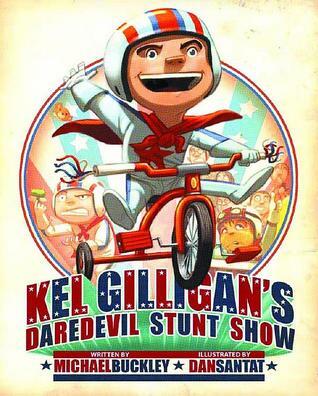 A while back I wrote a blog post about how authors are my rock stars. My husband loves concerts; he would travel far just to see his favorite bands. While I enjoy music, I am not that dedicated. However, a favorite author having a signing three hours away, I’m there. I thought about this in my class this week. Are authors rock stars to my students? At the start of the year, I would say not for most, but the tide is turning. 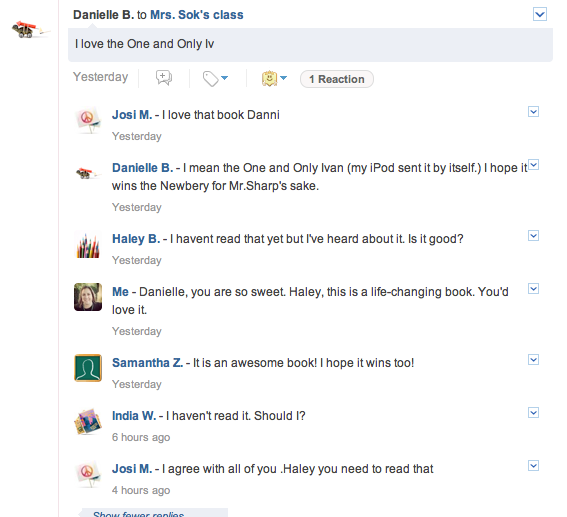 This week I introduced Edmodo to my classes. To say it has caught on like wildfire would be a colossal understatement. I finally had to turn my notifications on my phone off; the alerts I got from students posting and joining were making my dog crazy. Every so often I’d log on, ensure they were still on topic. What I read thrilled me. I saw students making book recommendations, discussing what they were reading, predicting the Newbery, and commenting on favorite authors. Five days in and I think we’re on to something good here. Some background for you all, although I don’t know if anyone needs it. I teach in central Illinois. Over the past years I have become friends with many wonderful teachers across the country. Two in particular are well known in my classes – Mr. Colby Sharp and Mr. John Schumacher, otherwise know as Mr. Schu. I should explain – my students have not met Mr. Sharp or Mr. Schu. We’ve Skyped with Mr. Schu’s students once, and even then they didn’t “see” him, just heard his voice. But we’ve talked about these two often. I’ve shown their Newbery videos. We’ve participated in their Sharp-Schu Twitter book clubs. 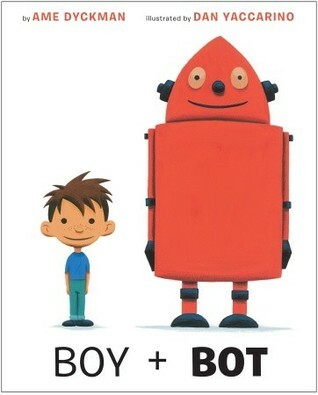 I’ve told the kids about book recommendations from the two amazing guys. So when I saw Danielle’s post I realized something. While I know my students want to meet many of their favorite authors, what I really think would make them crazy would be if Colby or John walked into our classroom. We’d have a full-fledged riot on our hands. And while that is not likely to happen, it makes me smile. Because I cannot think of two teachers, two readers, two role models, that I’d rather have these kids look up to than John and Colby. Thanks guys. I’m glad that my students see you guys as rock stars. I know many of us do as well. I’ll leave you with Colby’s Nerdbery video from June. I showed this to my students today. Three classes of 24 fifth graders singing along. All three classes stood up and cheered when he held up Ivan and Wonder. Pretty amazing way to end my week. Slice of Life - Why should you read?